Tania Michele: Box Swap With Abbie! So at the start of the year I was considering doing a box swap, so I tweeted about it to see if anyone would be interested in doing one with me. Luckily a day or so before, Abbie had tweeted the same thing, so when I done mine, so replied and we agreed to do one! I've been excited about it all January! We agreed on a price range of £15-£20 and then we would send them in the last week of January. I received mine on Friday and was very excited to open it up. Considering we both live quite a distance from one another, the boxes arrived pretty quickly! Now that everything has been photographed, I can share with you what was in my box from Abbie! 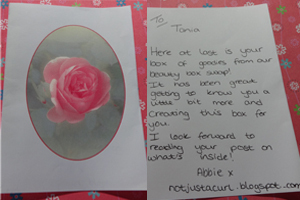 You can find Abbie over on NotJustACurl and her box swap post is HERE. I was greeted with this parcel from the Postman on Friday and realised what it was straight away, so ran to my room to open it! Inside was this amazingly wrapped box, tied with a ribbon and a little message for me was slipped under it. Opening up the ribbon and the packaging, I was greeted with this beautiful sight (I've stood the notebook up) and actually squealed as I'd spotted something I almost bought the other day! Firstly is this little spotty notebook which is now in my handbag ready for notes and doodling when I have a spare moment at work! I'll also be using this for blog and video ideas while out and about :) This is the perfect size for my bag as well, so very handy! 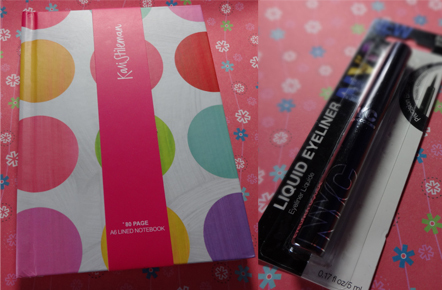 Next is this NYC Liquid Eyeliner which I've never tried before, so I am looking forward to trying this out! This is in 887 Black. I've only recently discovered the NYC range, so this has now added to it! It come with the precision tip so hopefully this will stop me being so messy! 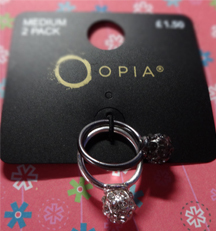 These beautiful rings are from Primark! I actually saw these about Christmas time in the store and almost bought them, so glad I didn't know! One is silver and the other is black, and you can wear them either as stack rings or separately! I've been wearing them over the weekend and feel very sparkly with them on. 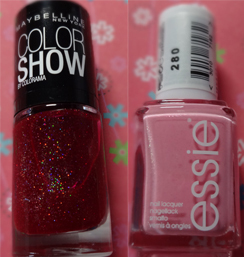 Firstly is the Maybelline Color Show nail polish in 265 Wine Shimmer. I LOVE this colour and it's sparkly as well which won me over the second I saw it. Will definitely be wearing this on my next night out! I've never had a Maybelline polish before, so I'm excited to try this out! It looks amazing on my nail wheel, so I know I'll love this when I wear it. Next is the Essie 280 Pink About It. I already have this, but Abbie didn't know that until she had sent the box (Sorry!!!) But, as I've used mine a lot, I will need another soon anyway, so it won't be going to waste! 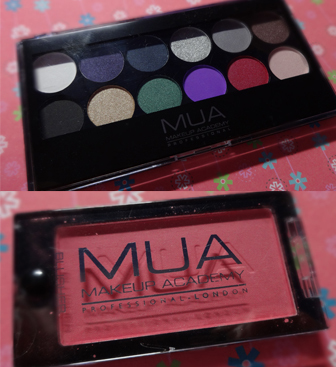 Lastly are these two wonderful MUA products. If you read my MUA Eye Shadow review post from the other day, you will know that this is a new brand that I've discovered. When in town the other day I almost picked up the eye shadow pallette, but then didn't as I was rushed from the store! I love all the colours in this and the purple is what caught my eye. This is the Glamour Nights pallette. The bottom product is a blusher called Bubble Gum! I love how rosy this colour is and it will look perfect with my complexion! Both are really nice and pigmented, so they will last me while and will be used a lot. Have you guys ever done a box swap? 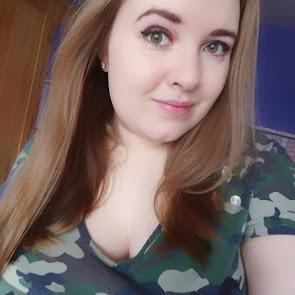 Hope you're having a great day and keep safe!